Dr. Sanity: HOPING FOR CHANGE? CHANGE THE SUBJECT ! 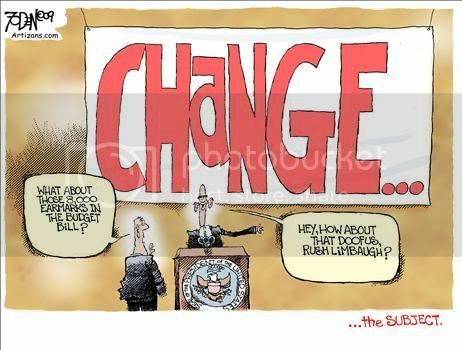 Limbaugh is a private citizen--a celebrity, to be sure, but a private citizen and if the government can go after him, or Rick Santelli, or Joe the Plumber; they can just as easily try to destroy you or me for their political purposes. To the extent that a person's behavior is mostly motivated by perceived insults to their self--i.e., their narcissistic core; then the "insult" will usually prompt a typical display of narcissistic rage directed toward the unfortunate individual who threatens them. Such rage responses are invariably destructive, mean, and petty. Additionally, these rages are generally not beneficial to society-at-large (in fact, such actions often have strong sociopathic or antisocial elements to them) , although the person in the throes of narcissistic rage will often convince themselves that they are behaving perfectly appropriately and even for "the good" of others. This is the origins of "sociopathic selfishness and "sociopathic selflessness" I have discussed elsewhere. Far too often, narcissistically flawed individuals are hopelessly attracted by the grandiose opportunities of the political arena (as well as the Hollywood arena) like moths to a flame. Their sense of self is starkly invested in the desire for power over others (always, of course, "for their own good") , constant admiration and adulation and grandiose ambitions. This makes them remarkably adept at what Steyn calls the "politics of personal destruction". For the narcissist it is always a zero-sum game he or she plays with other individuals. From the perspective of the narcissist, if someone else "wins", the narcissist "loses". It cannot be otherwise, since on some level they know that their own talent and skills are way overblown. Hence, they cannot hope to "win" based on those talents alone. Thus, the behavior of the classic narcissist is mostly directed toward making others lose so they can win by default. To that end, there is no behavior or tactic that is considered out -of-bounds or over-the-top. Hence the current state of political discourse and the ubiquitous personal attacks that have become the trademark of all political campaigns. If you want to understand why politics has become so virulent and personally vicious you need not look any farther that this sad truth. While politics still occasionally brings out those who have strong personal integrity and values; often it is the people of no integrity and values who are obsessively attracted to the field and are triumphant--and that is true on both sides of the political spectrum. By that, I mean that those who would actually make the best leaders generally opt out of the process, because they tend to be too healthy to generate the continual rage necessary to destroy all opponents; or they lack the required-- and mostly distorted --sense of personal "perfection" and grandiosity that drives the power-hungry. I am frequently reminded that it is hopelessly naive these days to expect the electorate to vote for a person based on what that person actually stands for; instead, these days most people respond to the negative campaign ads that slice and dice the other guy; and are mainly influenced by botoxed faces and Hollywood-packaged good-looks rather than the content of any candidate's character. The less they know of that character, the better! Do you imagine that a Golda Meir or a Margaret Thatcher would have a chance to become the first woman president of the US. Not these days, for sure. Real personal integrity and character comes from having a consistent set of values and exhibiting behavior driven by those values. Today's classic narcissistically-driven politicians like both Hillary and Bill can only flutter in the political winds, and zelig-like easily take on whatever characteristics their public care to project onto them. It is easy to be tough and ruthless with political adversaries in the US political battlefield. The kind of threat political adversaries pose is hardly life-threatening (though in other, less civilized nations it may well be). Political bullies like the Clintons, for example, feel perfectly safe in viciously attacking and denigrating those who oppose them. And, when it happens occasionally that a political adversary unexpectedly shoots back and won't go away, the bully easily falls back on the "victim" role and whines about "vast right-wing conspiracies" and such. This is not the kind of person who can face real threats in the real world very effectively because this is not the kind of person who can effectively deal with threats they do not perceive as personal--why should they care much about any other kind, unless the polls indicate they should?. Hillary Clinton did not get where she is today by being a person of integrity, honesty and courage--she got there by riding on the coattails of her charismatic husband; and by shrewdly altering her opinions to accommodate the prevailing political winds. And, oh yes, by ruthlessly destroying whoever got in her way. And even her base is able to recognize this about her, although she is extremely careful never to dirty her own hands. Like the Hamas and Hezbollah gunmen who shield themselves with innocent women and children, Hillary and her spouse have always had a ready supply of useful fall-guys (recall Vince Foster's suicide or Sandy Berger's recent archival exploits, for example) to take responsibility for their misdeeds. The best leaders are not obsessed with themselves; with polls; or with accumulating power by pandering to all sides. Those leaders may, in truth, have many other personal flaws--but not particularly of the dangerously narcissistic variety. Whatever those flaws (and we all possess them), they are characterologically able to be more concerned about dealing with external reality; rather than in preserving a distorted and fragile internal one. Avenging petty slights and insults is not a high priority to a psychologically healthy person. Those healthy individuals are far more likely to direct their psychological energy toward dealing with real-world geopolitical threats that endanger both their country and the people they have the responsibility to protect; rather than using that country or the power of their office to counter threats to their endangered self and act on their grandiose fantasies about themselves. The latter is the same psychological pathology that is rampant among dictators and dictator wannabes of all stripes. Their concern about others in their group/nation is purely of the “l’état c’est moi” variety. Look at Saddam's behavioral legacy. Observe the recent behaviors of Ahmadinejad or Chavez or Kim Jong Il -- or any of the other despots and thugs that somehow claw their way up to the top of the food chain in their respective countries. That the needs of the nation, or the people they serve, might be different from their own; or that doing the right thing is often different from doing the popular thing, are foreign and dangerous concepts. The only reality they know--or care about--is the one inside themselves. In Obama's case, the attempt to change the subject to Rush, or Santelli or Cramer--or anyone who dares to question him--serves to keep the public eyes off his toxic, transformational agenda for American society. It is just another calculated "sleight of hand" that deliberately misdirects the gullible mark; a trick that every good con artist learns early in his career. And Obama is a master at it.